This Friday I have an amazing tiara for you! It was made around 1900, and I'm sure it would fit my tiny head perfectly! Haha! In the center sits a sunburst and crescent moon motif over a large cushion-shaped diamond, on a scrolling frame of shooting stars, set throughout with old brilliant-cut diamonds, mounted in gold. The principal diamond is of approximately 1.75 carats, the rest of around 14.00 carats in total. It was sold at Bonhams for 16,250 GBP. 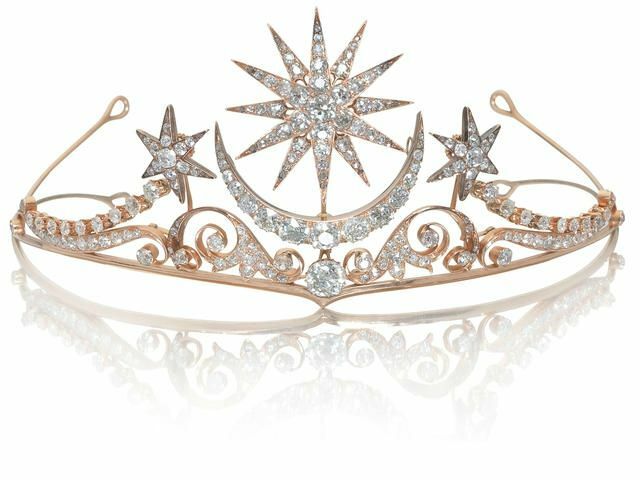 I wanted to let you know this sun, moon and stars tiara has inspired a hand-made tiara to be created for our first nephew's beautiful bride to wear on her wedding day in January 2019. Thank you for sharing it.